The 8051 Microcontroller is one of the basic type of microcontroller, designed by Intel in 1980’s. This microcontroller was based on Harvard Architecture and developed primarily for use in embedded systems technology. Normally, this microcontroller was developed using NMOS technology, which requires more power to operate. Therefore, Intel redesigned Microcontroller 8051 using CMOS technology and their updated versions came with a letter C in their name, for instance an 80C51 it is an 8 bit microcontroller. These latest Microcontrollers requires less power to operate as compared to their previous versions. The 8051 Microcontroller has two buses and two memory spaces of 64K X 8 size for program and data units. It has an 8 bit processing unit and 8 bit accumulator units. Following diagram is 8051 Microcontroller architecture . 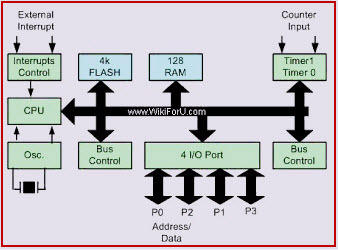 Let us have a look at each part or block of this Architecture of microcontroller. As we know that the CPU is the brain of any processing device of the microcontroller. It monitors and controls all operations that are performed on the Microcontroller units. The User has no control over the work of the CPU directly . It reads program written in ROM memory and executes them and do the expected task of that application. As its name suggests, Interrupt is a subroutine call that interrupts of the microcontrollers main operations or work and causes it to execute any other program, which is more important at the time of operation. The feature of Interrupt is very useful as it helps in case of emergency operations. An Interrupts gives us a mechanism to put on hold the ongoing operations, execute a subroutine and then again resumes to another type of operations. Out of these, (INT0) ̅ and (INT1) ̅ are external interrupts that could be negative edge triggered or low level triggered. When All these interrupts are activated, set the corresponding flogs except for serial interrupt,.The interrupt flags are cleared when the processor branches to the interrupt service routine (ISR). The external interrupt flags are cleared when the processor branches to the interrupt service routine, provides the interrupt is a negative edge triggered whereas the timers and serial port interrupts two of them are external interrupts, two of them are timer interrupts and one serial port interrupt terminal in general. Microcontroller requires a program which is a collection of instructions. This program tells microcontroller to do specific tasks. These programs require a memory on which these can be saved and read by Microcontroller to perform specific operations of a particular task. The memory which is used to store the program of the microcontroller is known as code memory or Program memory of applications. It is known as ROM memory of microcontroller also requires a memory to store data or operands temporarily of the micro controller. The data memory of the 8051 is used to store data temporarily for operation is known RAM memory. 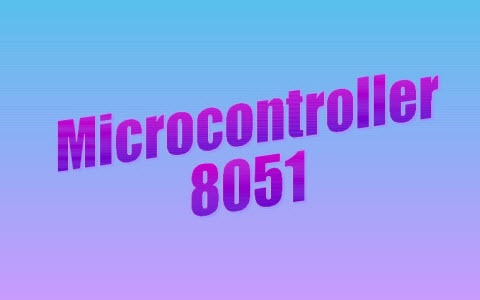 8051 microcontroller has 4K of code memory or program memory,that has 4KB ROM and also 128 bytes of data memory of RAM. Bank address (or) Register addressing mode. Data Bus: Microcontroller 8051 has 8 bits of the data bus, which is used to carry data of particular applications. Generally, we know that the microcontroller is a device, therefore it requires clock pulses for its operation of microcontroller applications. For this purpose, microcontroller 8051 has an on-chip oscillator which works as a clock source for Central Processing Unit of the microcontroller. The output pulses of oscillator are stable. Therefore, it enables synchronized work of all parts of the 8051 Microcontroller. 8051 microcontroller has two 16 bit timers and counters. These counters are again divided into a 8 bit register. The timers are used for measurement of intervals to determine the pulse width of pulses. The applications of 8051 microcontroller involves in 8051 based projects. The list of 8051 projects is listed below. Do you have any innovative ideas to implement the 8051 microcontroller based electronics projects? Then, feel free to share your ideas for getting your project solutions from us and also other readers, by posting in the comments section below. 2- current (amps) low & high stops relay 3 .- real time & running time. 4- set time for stop relay. Really thanks for your Appreciation. I’m a student of mechanical engineering at national institute of transport(NIT) school of aviation. My project title is DESIGNING AND IMPLEMENTATION OF ELECTRICAL POWER THEFT DETECTION in this project I choose to use 8051 microcontroller but I don’t have well knowledge on it please help me. em a electrical engineering student…i would like to do mi project on the topic PARKING AVAILABILITY INDICATION SYSTEM using 8051 microcontroller…..but em not thorugh in this subject….can u pls help mee…. This is very clear information and knowledge about microcontroller 8051 s0 thanks of and God bless you. very crisp and understandable…gave me a clear picture of 8051. Thank you 🙂 Wonderful article. Discuss briefly about the interrupts of the mc ic 8051? How can we use Microcontroller to detect millivolts? And what will be the voltage range for ADC? You have to code the microcontroller to detect and measure the millivolts. ADC is just an analog to digital converter and you have to refer the datasheet of the particular ADC.